Apollo’s Hegemony Blue Edition is an innovative product in the field of fat burners. It is distinguished by the fact that it doesn’t focus only on direct support of mechanisms aiming at intensification of lipolysis and increase of metabolic rate, but it also supports the nervous system in the wide scope, often skipped in supplementation - and as widely known, during weigh loss it requires special support due to additional stress factors, resulting from calorie deficit. Metabolism improvement is directly influenced by the revolutionary combination of forskolin and niacinamide. It demonstrates high potential to stimulate metabolism by intensifying the production of cAMP and it slows down its degradation. Moreover, these substances positively influence increasing the amount of mitochondria and intensifying their activity. This effect is complemented by rauwolscine, a molecule similar to yohimbine, however, with much bigger potential of antagonist affinity to alpha-adrenergic receptors, which consequently increases the level of noradrenaline, cAMP and reduces appetite. In the context of maximal support of the nervous system Acetyl-L-Carnitine and N-Acetyl-L-Tyrosine were used, the compounds, which, by structure modification, demonstrate much bigger affinity to the support of the nervous system, thanks to effective crossing of blood-brain barrier. As a result, it causes intensification of the production of neurotransmitters, which are important both in thinking processes and in optimal level of metabolism. They also directly influence the improvement of bioenergetics of the organism by stimulating mitochondrial activity. Alpha GPC - the most effective form of choline - also influences the improvement of the state of the nervous system, mainly by increasing the level of acetylcholine. It is complemented by Huperzine, which additionally increases to pool of effective acetylcholine, by slowing down its degradation. In the context of direct support of stimulation and energy level, we will also find the combination of caffeine anhydrous and theanine in the product. The former is one of the most effective stimulating substances and increases effort abilities. Theanine, in turn, rarely occurs in other supplements and influences synergistic activity of caffeine, improving at the same time general well-being. We will also find other substances in the product which demonstrate high synergy with the above ingredients. Green tea extract - causes intensification of stimulation and the effects of lipolysis, by preventing degradation of catecholamines, responsible for these effects; willow bark extract - improves intercellular activity of signaling pathways, which stimulates even more the effect of the applied stimulants. Moreover, the product was complemented with metabolically active forms of vitamin B9 and B12 - methylfolate and methylcobalamin - responsible for maintaining the nervous system under control, which is exposed to the excessive activity of stress factors. Piperine, on the other hand, influences increasing bioavailability of active ingredients. 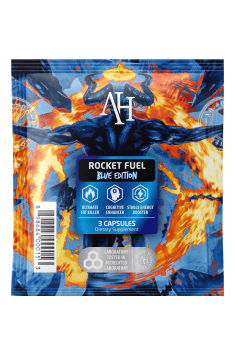 To sum up, Rocket Fuel Blue Edition is an completely innovative product in the context of fat reduction. It is distinguished by the application of ingredients, which bind with one another thanks to large synergistic potential. Additionally, the product does not only influence metabolism and stimulation. What is exceptional about this product is its wide support of the nervous system and cognitive functions, which is an interesting alternative to the nervous system, often dimmed under the influence of stimulants present in other products. Take 3 capsules the product 30 minutes before workout. Take 3 capsules it in the morning, or before intensive intellectual effort. When you are very responsive to stimulants, the initial dose should be one capsule daily. Do not take the product in the late evening because it may cause sleep discomfort. When you experience digestive discomfort while taking the product on an empty stomach (caused often by an oversensitive stomach), it is recommended to take it with a meal to reduce this effect. N-acetyl-L-tyrosine - acetylated form of tyrosine (an endogenous amino acid) improves the solubility and bioavailability of active ingredients. It can be used in lower doses than those taken as free tyrosine. It has a higher availability to the nerve tissue, reduces the feeling of fatigue, improves the exercise capacity psycho (psychostimulant), and, it is a additive to thermogenic effect preparations. It is used in medicine (increases levels of neurotransmitters including dopamine and norepinephrine) and sports dietary supplementation, in pre- and post-workout supplements, as well as fat burners, no-boosters and pre-workout creatine stacks and supplements and energizing beverages. Dosage: In divided doses ranging from 100-300 mg per day. The extract from the bark of the white willow (Salix alba) is a rich source of salicylates (such as salicylic acid belonging to the hydroxy carboxylic acid). The components of the extract are analgesic, anti-inflammatory. In combination with caffeine, bitter orange extract (Synephrine), and green tea extract (ECGC) may accelerate the reduction of body fat (weight loss). It is thermogenic accelerating fat burning. Due to the allergenic effects of salicylates are not recommended to allergic people. Used in supplementation programs of active people to support the functioning of the musculoskeletal system, the reduction of body fat. Forskolin (Coleus forskohlii) - Indian coleus is an Asian plant, of which the root is the source of biologically active diterpenes. It has been proved that forskolin activates adenylyl cyclase and increases cAMP levels, affecting the growth of muscle mass and reduced body fat. Reduces the level of cortisol hormone with catabolic action to muscle tissue. In the supplementation used as part of the support of physical effort to and to build silhouette and reduce body fat. Part of the thermogenics and supplements providing the proper functioning of the endocrine system. It is a component of nitrogen boosters. Dosage: 25-100 mg daily, based on 100% forskolin.